While Viva La Vida at first appeared experimental, slightly ominous and even downright subtle in spots, Mylo Xyloto is an album on which Coldplay is not afraid to consistently and unapologetically display its overtly pop side. In the past, the mystery and experimental musical detours meant that listeners needed time to fully absorb and understand the music. 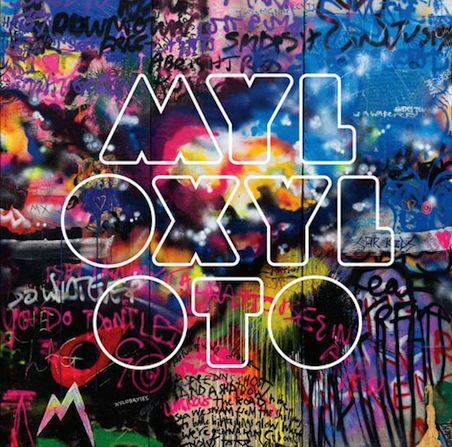 Mylo Xyloto is fully realized and instantly revealed on first listen. From the very beginning, Coldplay conveys an inviting musical tone on the instrumental title track, which sounds like the bells of a church in London on Christmas morning. From there the first song with vocals is “Hurts Like Heaven,” which lyrically sets the tone. It offers the group’s most overt lyrical look at the economically-challenged world we live in where so many people are out of work and facing tough times. “Paradise” also follows this theme, but in a more personal, emotional and spiritual way. It has a near Genesis-like feel, particularly the guitar work of Jonny Buckland. “Paradise” also references the title of “Every Teardrop Is A Waterfall,” and, like that song, it continues a feeling of empathy and seems to be a veiled reference to a Buddhist or other Eastern philosophy that if one person is suffering, we all are. “Charlie Brown,” one of the most exciting new songs on the group’s recent tour, stakes out new musical territory. “Us Against The World” is one of several very stripped-down, acoustic tracks and gives a sense of the recording’s genesis. Lead single “Every Teardrop Is A Waterfall” was inspired by a nightclub scene in the movie Biutiful, directed by Alejandro González Iñárritu. As it turns out, the song that was on the soundtrack was actually based on Peter Allen’s “I Go To Rio.” It’s the most overtly pop song on the album and continues to reflect the growing guitar talents of Jonny Buckland. The success of these past two Coldplay albums says as much about Coldplay as it does about Brian Eno. While the group’s first three studio releases were highly successful, they can’t compare to Viva La Vida and immediate chart success of Mylo Xyloto. Some of this success has to be attributed to Eno’s involvement. While it appears he was less involved with this new release (his credit in the liner notes, positioned under the album’s co-producers Markus Dravs, Daniel Green and Rik Simpson, reads: “Enoxification and additional composition by Brian Eno.” That may be purposely understated and oblique at Eno’s request. It’s interesting how a record producer whose career is so rooted in the avant garde (early Roxy Music, his collaborations with Robert Fripp, ambient music, etc.) has been able to help great rock bands achieve such mainstream pop success, without diluting what they do. Although the reviews of this new album have been overall very positive in their praise, the group still has its critics. It’s a shame that a band that tries to be uplifting and have such respect for its audience is often scorned for those very reasons. What Coldplay seems to be is a group that proves that a rock band taking album-making seriously is a worthwhile endeavor. The hope the group has for the idea of the album and for the world, makes it the right band at the right time.